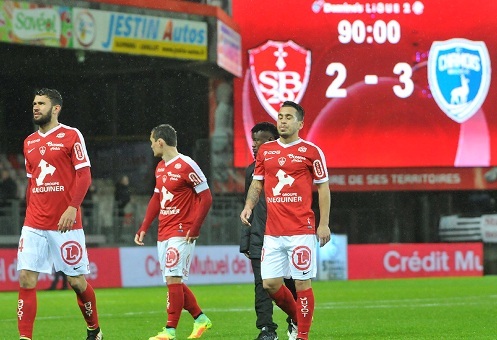 Niort – Brest predictions for France Ligue 2 match at Stade Rene Gaillard, Niort. Les chamois are in the poor run. Read on for live streaming info and our free predictions. Do you want to watch live streaming of Niort – Brest and bet live? Go to bet365 Live Streaming and place winning bets! Niort started the season successfully, having managed to avoid defeats in four consecutive rounds, moreover, they have conceded only one goal in these 4 games and were able to take eight points. It seemed that the team will continue their unbeaten run, but Valenciennes just destroyed them in the fifth round with a score of 4-1, leading in three goals after the first half. In the next match, Les chamois conceded two goals in Paris, and last week Niort’s goalkeeper had to pull the ball out of the net three times in Orleans. If in the season`s first four games the hosts conceded only one goal, then they conceded nine in the next three games. The hosts’ defence does not withstand criticism, and the guests will take advantage of this. Brest have always successfully performed at Stade Rene Gaillard, having managed to win four of their last five visits, and today will take points again! Brest unlike today’s opponent started this season unsuccessfully, but very quickly gained momentum and have 4-matched winning streak now, it is worth paying attention to the names of defeated rivals. The guests without any problems beat such clubs as Nancy, Reims and Le Havre. Brest look like a team that nobody can stop at the moment, and no doubt this is beyond Niort’s power. The visitors’ defence looks invulnerable as they conceded only one goal in their last three rounds. It is possible that the hosts get a grip and will be able to hold a draw, but they definitely will not win – Brest certainly get points.